Half the people camped overnight at Banka Banka were all heading to Daly Waters! LOL! 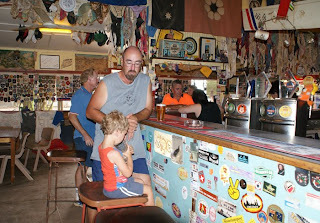 And we had been told by a few people along the way to make sure we called into the Daly Waters Pub. So even if John and Naomi, and Arthur and Barb were not working there we would have had to call in for a look anyway. We pulled into the Renner Springs Roadhouse on the way through for a fuel top up (Tim calls it a 'splash and dash' when the fuel is a rip off but you need a bit to stay safe). It looked like a decent enough place to stop the night if it suited your timetable. It felt like a hot trip today for some reason so it was great to arrive in Daly Waters. And even beter to get a wave and a cooee from people already in the park when we drove through- Jessee and Judy from Tennant Creek and a few others. It really is great to see a familiar rig and a familiar face when you pull into a new town. John came over for a chat and over the next couple of hours we saw several couples arrive that we recognised. Headed over to the pub for a swim in the pool. If you did not look too closely at the water quality it was lovely! After that we sat and had a drink in the beer garden while the kids had a play and explored all the junk they have collected and on display around the pub. Later in the afternoon while i slaved away getting a head start for tomorrow's dinner and folding laundry and washing up and bathing the kids (insert violin music) Tim headed back over to the bar and found himself a stool for the afternoon. He had a great time talking to some of the guys working there and met Lindsay (the owner). Jordy stayed with him for a while and sat up at the bar with his pot of water and bowl of chips and gave the other patrons a giggle :) They had a Toss the Boss Happy Hour and Tim won himself a couple of free rounds. By the time we came over for dinner he had his glazed happy face on :) Despite the fact that it was more than we would normally spend on dinner we decided to try the Beef and Barra that the Pub is famous for. And while the salad range was no more special than you'd get at the local bowls club all-you-can-eat if was still a good meal, more so for the relaxed atmosphere than anything else. Lindsay's son played guitar and sang for most of the night and John's young son Bailey (who is about 8ish) joined in and sang a couple of tunes which was rather cute. 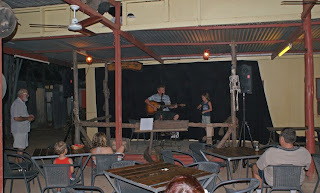 Jordy did not want to sit with us and instead sat with John's kids right up the front and after Bailey finished singing Jordy wanted to have a go too. I told him he could learn a couple of songs so next time we come though he could sing :) Both boys played for ages before Darcy crashed in his stroller and we walked Jordy back home totally exhausted.